In the Ottoman province of Hijaz during World War I, a young Bedouin boy, Theeb (Jacir Eid), experiences a greatly hastened coming of age as he embarks, uninvited but eager for adventure, on a perilous desert journey with his elder brother Hussein (Hussein Salameh) to guide a British officer Edward (Jack Fox) and his guide Marji (Marji Audeh) to their secret destination. ‘Immersed in a way of life that has endured for centuries, the brothers are unaware of the tremendous upheavals taking place at the fringes of their world: the First World War is raging in Europe, the Ottoman Empire is coming undone, the Great Arab Revolt is brewing, and the British officer T.E. Lawrence is plotting with the Arab Prince Faisal to establish an Arab kingdom. The ensuing journey, filled with danger and hardship, will result in Theeb's greatly hastened maturation. If Theeb is to survive he must quickly learn about adulthood, trust and betrayal, in a culture where a man's honour and righteousness determines his inclusion or expulsion from the community. 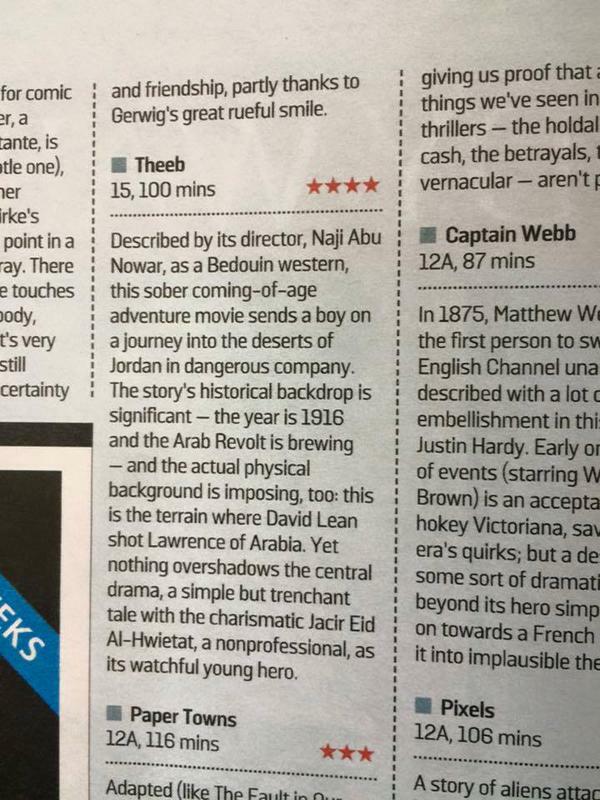 Shot entirely on location against the ravishing landscape of Wadi Rum and Wadi Araba in Jordan, and cast with non-professional actors from one of the last of Jordan's nomadic Bedouin tribes to settle down, Theeb is a remarkable accomplishment ‘a skilful, genre-crossing blend of a coming-of-age drama and a western’ (Rasha Salti, TIFF). Buy the DVD or Rent the film online. Born in the UK in 1981, Naji Abu Nowar began his filmmaking career when he was accepted into the 2005 RAWI Screenwriters lab held in association with the Sundance Institute, to develop his first screenplay ‘Shakoush’ (Hammer). He then wrote and directed the short film ‘Death of a Boxer’ (2009) which screened at international film festivals including the Palm Springs International Shortfest, the Dubai International Film Festival, the Miami Short Film Festival and the Franco-Arab Film Festival. Theeb is Naji’s debut feature film. In 2014 Variety honoured Naji with their prestigious ‘Arab Filmmaker of the Year’ award. 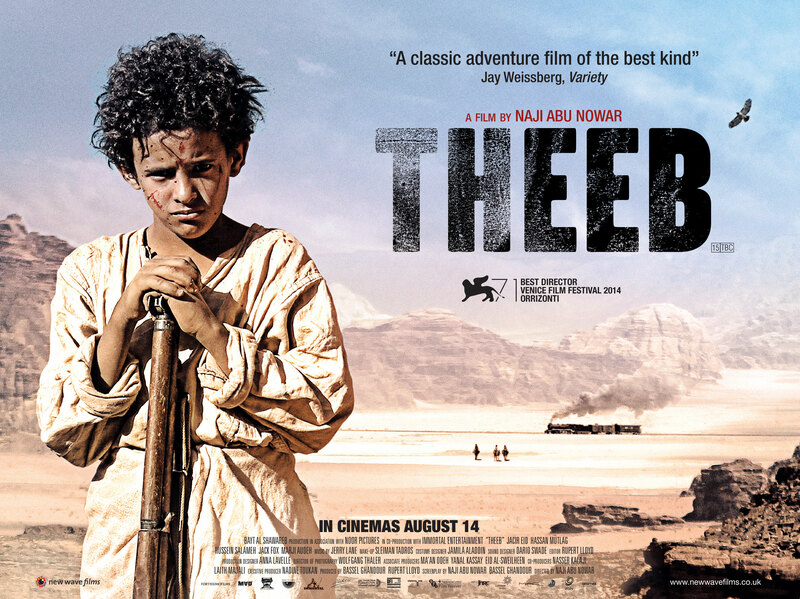 "A coming-of-age tale framed within an Arab Western, while also offering a very different perspective on the era of Lawrence, Theeb is a simple but very effective adventure." Short video interview with Naji Abu Nowar from the London Film Festival.